We were asked about four weeks before tonight to schedule Lord Michael, at his request, for an interview tonight. We learned just Friday that today is Michael Mass, and his birthday. Both Karen and I had worked with Lord Michael long before we met in person. We worked with him in April 2002 in New York before we met by phone on September 15, 2002. He was with us at St. Patricks Cathedral in New York, in St. Michael’s nave or Chapel when each of us went there, separately and unbeknownst to each other, to tell him we were ready for our true spiritual partner. We were there at the same time and all I can say for sure is there was a woman with dark hair who was also lighting a candle at the same time I was. Archangel Michael later confirmed that he brought us together at his altar that day to introduce us after all this time. He also explained that ours was a karmic marriage continuing through ages. Patricia Cota-Robles posts this information about Archangel Michael: September 29, 2013, is Archangel Michael’s Feast Day. On this sacred and holy day, the Light of God is exponentially expanding on Earth. 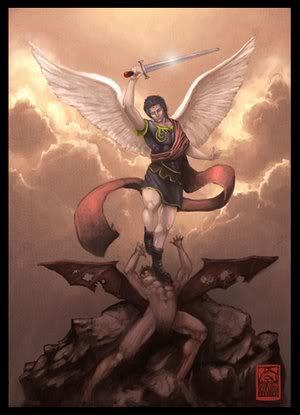 Archangel Michael has directed his Legions of Power and Protection to help the I AM Presence of every person on Earth to envelope each one in an invincible forcefield of Light and protection. The Divine Intent of this forcefield of Light is to prevent the ever-expanding influxes of Light from our Father-Mother God and the Realms of Eternal Light from creating excess stress on our physical, etheric, mental, and emotional bodies, as we continue to move through this Ascension process at warp speed. This forcefield of Light and protection will expand in, through, and around the bodies of Mother Earth and the Elemental Kingdom as well. In order to successfully accomplish this for every man, woman, and child on Earth, Archangel Michael is invoking our assistance. He gave us a decree many years ago that is designed to protect Humanity from interference from anything that is not of the Light. This forcefield of Light and protection is also designed to lift Humanity above the fray of our human miscreation and the surfacing chaos in the outer world. If this decree resonates in your Heart, please say it today and for as many days in the future as your I AM Presence guides you to do so. I AM deeply grateful for your willingness to add to the Light of the world. God Bless YOU! As One Heartbeat, One Breath, One Voice, and One Energy, Vibration, and Consciousness of Pure Divine Love I Invoke Archangel Michael and his Legions of Power and Protection. Powers of Light, come forth NOW! Encapsulate me and all Humanity in your invincible Circle of White Lightning, the Ring Pass Not of God’s First Cause of Perfection. Prevent anything that is not of the Light from interfering with our service to the Light and our Divine Mission of Loving ALL Life on this sweet Earth FREE. from every line of force that connects us with imperfection of any kind, and send your powerful Blue Flame to dissolve each line of force to its end. me and every person on Earth in your Cross of Blue Flame and your Ring Pass Not of God’s First Cause of Perfection now and forever! I so decree it, and accept it done, through the Power of God, I AM. And so it is. Please leave your comments and reactions to this interview below. We have been instructed by The Masters to distribute this to a small circle of our friends and let the distribution go forth from there. As of today, we have been further instructed to post this for your additional distribution as you see fit: If you feel the power of this interview and have others who would possibly feel the same reaction, post this directly to them with your personal endorsement and nothing else.